On January 24, 1848, James Marshall discovered a small nugget of gold in a stream near Sutter's Mill, California. Though he tried to keep it a secret, word spread through the country like wildfire. Before the year was out, the great American Gold Rush had begun. Here's a true-life story that re-creates a time when people from all walks of life dropped what they were doing and headed west with picks and shovels in the hope of finding riches--and added a brand-new chapter to our country's history. About May Yonge McNeer (Author) : May Yonge McNeer is a published author of children's books and young adult books. 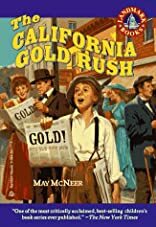 Some of the published credits of May Yonge McNeer include California Gold Rush, America's Mark Twain.